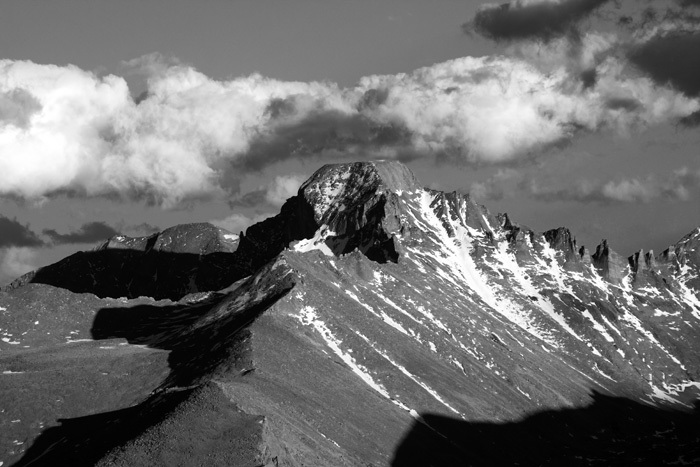 This photo of Longs Peak was taken from Trail Ridge Road in Rocky Mountain National Park. Longs Peak has an elevation of over 14,400 ft and I climbed to the top of this peak in 2000. I used a 300 mm lens to compress and add scale to the image. The temperature was in the low 90’s when I left my house near Boulder in the mid afternoon, but when I reached my location, I needed a jacket. The view from this location is spectacular as you see Longs Peak and the Continental Divide. Trail Ridge Road climbs above the tree line to the elevation of 12,000 ft. This Alpine Highway is also the highest continually paved highway in the United States. Photo © copyright by Mike Barton.